This is a guest-post by Eric, WD8RIF. I’ve had my Sony ICF-SW7600G for almost twenty years. Early on, my very young son broke the receiver’s telescoping whip antenna and it was a simple and inexpensive matter to order a replacement whip assembly from Universal Radio, the Sony dealer from whom I had purchased the radio. In comparing the replacement antenna with my original Sony part, the only difference I could see is that the metal tip of the replacement antenna is of a different style. Dimension-wise, the two antennas appeared to be identical. Installation of the new antenna was simple. A single screw secures the antenna to the radio. Remove this screw and pull the antenna straight out of the receiver. It should be possible to slip the new antenna into the hole, twisting it to properly line up the mounting-flange, and run the screw back into place. In my case, the new antenna insisted on snagging on something inside the radio and I ended up removing the rear-panel entirely to install the new antenna rather than try to force the antenna into place. Fortunately, the rear panel is easily removed. Remove the battery-cover and the four AA cells. 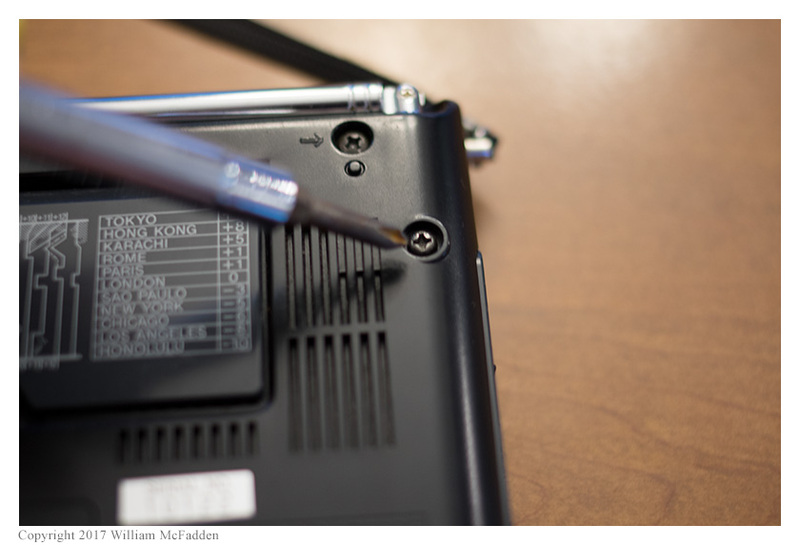 Remove the five black Phillips-head screws that are marked on the rear panel with arrows. The rear panel will then lift straight up. Insert the new antenna into its hole, lining up the mounting flange with the screw-hole, and insert and tighten the screw. Carefully place the rear panel into place, lining up the four screw holes, and insert and tighten the five screws. Re-insert the AA cells and replace the battery cover. I’m hopeful that this non-OEM antenna will prove to be rugged but time will tell. If this antenna proves to be inferior than the original in some way, I will post a follow-up to this post. Obligatory disclaimer: I don’t know stone_deng, and I don’t have any financial interest in his company or products. Eric McFadden (WD8RIF) is the author of this post and a regular contributor to the SWLing Post. Click here to visit Eric’s website which features QRP operation. Eric is based in Athens, Ohio. This entry was posted in How To, Portable Radio, Uncategorized and tagged Eric McFadden (WD8RIF), ICF-SW7600G, Shortwave Radio, Sony, telescoping antenna on January 21, 2017 by Eric. Did someone know where i can find a replacement antenna for a icf sw55 ? Can’t find one on ebay or others web sellers. Do not , repeat not, put excessive torque on the tiny screw fixing the telescope to the rotating joint. Yes, the tiny copper washers are a mandatory fixing . They ensure a stable position without (!!) applying too much torque to this joint. 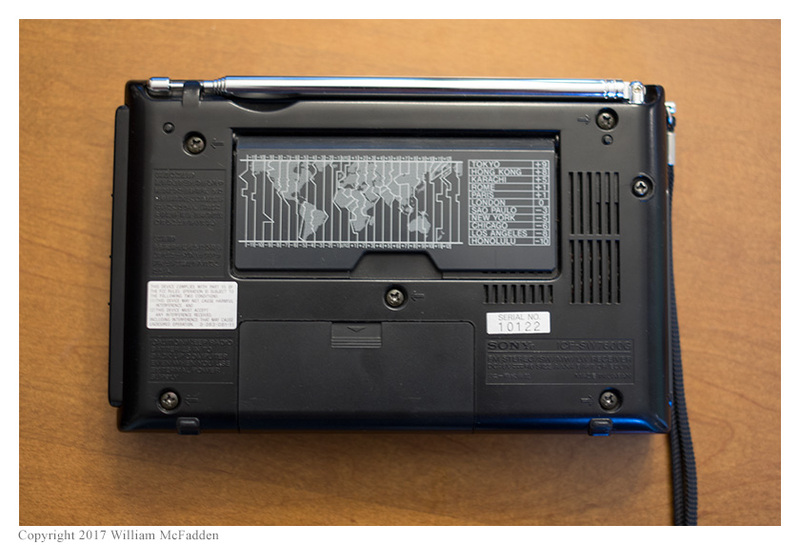 Do not try to replace the body-mounted swivvel without removing the back-cover. There is a contact-plate attached to the case mounted flange which connects this antenna to the main board. Don´t let this little spring loaded gimmick go astray in the innards of the radio. The rotating joint sometimes does not rotate properly with acceptable torque applied. If you try to turn the antenne forcefully, the body-mounting may break away, and then you have real problems. I have fixed the stump of the body-mounted part with high performance 2-component-glue to the case. Be careful, if you try this. Put the back cover on end and apply the liquid glue with caution. Don´t overdo it. Allow sufficient time for the glue to harden. 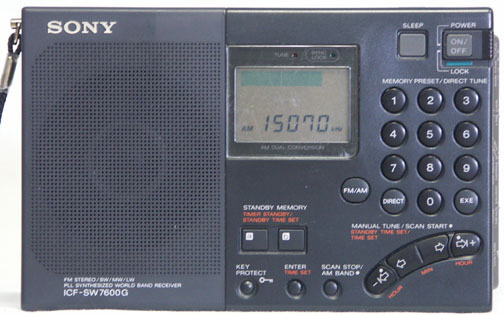 Incidentally, I happen to own nearly every Sony shortwave receiver made from 1965 – 2005. In the true portable range the above mentioned models are the best. Thanks, R.C! These look very good hints and I’ll keep them in mind the next time I need to fix one of these antennas. Just wanted to say thanks Eric for sending this bit of info to Thomas for posting. I received mine from stone_deng yesterday and have stored it in my Sony SW-7600GR’s go bag as insurance against a future need. Has anyone found a replacement antenna fir a Sony 2010? I’ve looked everywhere, but haven’t had any luck. Thanks for the tips. My SW7600G had its whip antenna accidentally broken by a cleaning lady. After sometime trying to find a replacement, I was advised to get a DE1103 whip antenna which is different in shape but fits perfectly. I found it on ebay and used it to replace the original one. So far so good. As the antenna loosens over time, would inserting a thin washer/spacer be a better option than just trying to keep tightening the screw? The original antenna already had a pair of very thin washers at the pivot. Any replacements would have to very thin, thinner than I’ve seen at a hardware store. Perhaps something thin enough is available at a hobby shop or other specialty store. An alternative would be to get a 2mm screw long enough to leave threads exposed, and use a nut on the exposed threads to “clamp” the swivel. This is actually the first thing I did when I stripped out the head of the screw in my original antenna, but I used a locally-available non-Metric screw that was small enough diameter to have a clearance-fit through the threaded portion of the antenna, and using the original pair of very thin washers. It worked well until I eventually over-torqued the screw and broke the head off. A 2mm hardened screw, such as the one I got at the R/C hobby store, but in a longer length, might work in this application. I might actually try this with my original antenna, the next time I find myself near that R/C hobby shop, and keep it as a spare if it works. I’m glad you were able to find a replacement. Are you able to tighten the screw on the OEM antenna better than on the original? I have a GR and this seems to be a systemic problem with the antenna flopping over and you just can’t get the screw tight enough to prevent it. I think it might have been better if the antenna telescoped out of the case instead of using the swivel attachment. I have a couple of Worldband radio’s with the telescoping antennas that are 40 years old and the antennas are fine. I presume you mean the non-OEM replacement antenna; i.e., the non-Sony replacement. I haven’t tried to tighten the screw at the swivel yet. At this point, the swivel seems tight enough to keep the antenna upright when I’m using the radio’s back-stand. The problem you describe is what ultimately caused me to replace the original antenna–I destroyed the screw-head trying to tighten it and them stripped the threads with the replacement screw. I bought the same replacement antenna for my 7600GR from China. I do not need it at the moment, but it was quite cheap and I wanted to have this little insurance for one of my favourite radios.